The name Miles Morales is just about everywhere these days. With a new starring role in Sony’s animated Spider-Man: Into the Spider-Verse and a brand new ongoing comic book series by Saladin Ahmed and Javier Garron, it seems like everyone’s been bitten by a brand new radioactive spider. That made us wonder: If there’s a Peter Parker from Miles’ world, does that mean there would be a Miles Morales from Peter’s? The answer is, unsurprisingly, “Yes, of course.” But the finer points of what that means are … well, a little weird and a bit complicated. What did you expect? It’s comics. The first thing you’ll need to understand when you start your Miles Morales journey is the distinction between the “regular” Marvel Universe — traditionally designated “Earth-616” by fans — and the Ultimate Marvel Universe. The “Ultimate Marvel” line was a suite of early ‘00s comics series designed to be a set of great “introductory” stories for new fans. They would often retell and reframe vintage origin stories and start at the beginning of familiar characters’ histories, giving readers a fresh, ongoing story to jump into without the burden of decades worth of history to catch up on. The Marvel multiverse is full of alternate realities, but for a good chunk of time the two “big” ones were the Ultimate Universe and the regular 616 universe — they were the two you needed to pay attention to. Everything on each incarnation of Earth was functionally the same — unless we were told otherwise. In our timeline, for example, George Washington crossed the Delaware River with his men on Christmas Day in 1776, and so unless specifically contracted by some aspect of an alternate history, you could assume that George Washington crossed the Delaware on Dec. 25, 1776. For the same reason, you could assume every alternate reality had some version of the other Earth’s characters. They may not all look the same or have the same personality, or same life experience, but you can assume that there was a Peter Parker on every Earth, a Steve Rogers, a Jessica Jones, and so on and so forth. 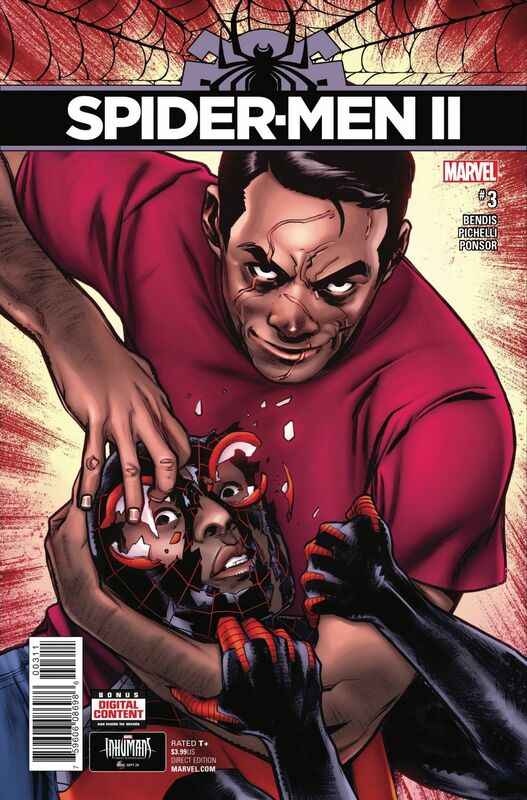 The Miles Morales of the Ultimate Universe was a kid who was bitten by a radioactive spider and became Spider-Man. The Miles Morales of the 616 universe was not that. He was, strangely enough, a criminal with a creepy scarred up face and a pretty awful record. He also worked for Wilson Fisk for a time. So, basically about as far from a Spider-Man as you could possibly get. This version of Miles was introduced in 2017, in the rather confusingly titled Spider-Men II #1, by Brian Michael Bendis and Sarah Pitchelli — and here’s where things get really wild. Miles Morales — the good Miles Morales — was the Spider-Man of the Ultimate Universe for a handful of years, kept separate from the events of the 616 Universe, where Peter Parker was still Spider-Man. Until 2015, when an event called Secret Wars happened. Then things started to get a little less clearly defined. Secret Wars was a giant, cosmic smash that destroyed a lot of Marvel’s many, many parallel Earths. By the end of the story, many of them were remade, and luckily for Miles, the people remaking the universes rescued him and a whole swath of his continuity, like his mother, father, and friends — and folded them into the new 616 version of events. This meant both Miles and Peter were Spider-Man in 616, and the Ultimate Universe was, basically, defunct. But there was still the matter of Earth-616’s native Miles Morales. There were two versions of the same person existing on the same Earth at the same time — not the best news for the time-space continuum. ”Evil” Miles actually mostly tried to keep his head down following Secret Wars. His backstory was full of hard time and shady connections, but his daily life was relatively mundane. After being released from prison, he really only wanted to live a normal life with his girlfriend, Barbara Sanchez. 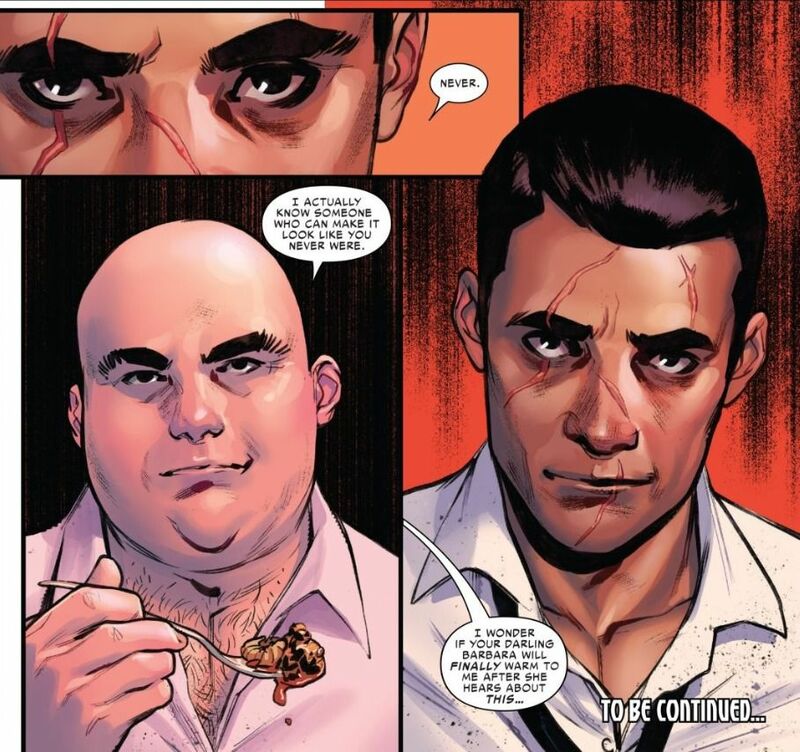 But Miles’ prison-based connections to people like Wilson Fisk weren’t so easy to leave behind. Eventually, Barbara was killed under mysterious circumstances, and Miles was left desperate and spiraling — which allowed Fisk to move in and offer a “solution.” He could offer Miles a way to escape this Earth for another one, one where Barbara was alive. With the help of both Fisk and the villainous jack-of-all-trades, Taskmaster, Miles hatched a plan to transport himself into this other dimension. This, unsurprisingly, caught the attention of both of Earth’s Spider-Men. Peter and the Good Ultimate Miles confronted the bad guys and both incarnations of Miles’ realized they were meeting their doppelgangers — though the moment was anything but touching. “Evil” Miles shot Ultimate Miles in the shoulder, and promptly escaped through the dimensional portal which, in a moment of pure comic book symmetry, sent him right to the old Ultimate Universe where he, presumably, was able to live happily ever after with the Ultimate version of Barbara, as that world’s one and only Miles Morales. It’s all a pretty complicated way to say that two different versions of the same person switched places on a cosmic level and balance was maintained through the multiverse. Of course, this does mean that the other Miles is, technically, still out there, ready and waiting to come and be a thorn in the side of our Miles at some point in the future, whether in a comic book plot or in one of the planned Spider-Man: Into the Spider-Verse animated spin offs. After all, it’s the Marvel Multiverse. Stranger things have happened.